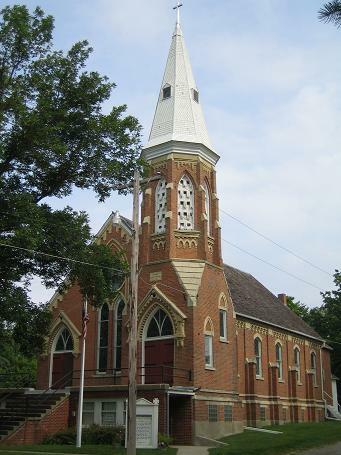 We invite you to visit the church built in 1876 when the James Wilder family were members. Church records reveal that pastors or presiding elders baptized and performed marriage rites for Eliza Jane and Laura Ann Wilder. Records also indicate that Almanzo and Laura (Ingalls) Wilder attended here in 1890 and 1891. When contruction of the Methodist Church at 221 West Courtland began in 1876, James M. Wilder was among the early contributors. His pledge of $50 was one of the largest amounts. As early as 1858 the Methodists raised $2,000 toward a building while they continued to meet regularly in the upstairs hall at Parson's Stone Block. It wasn't until 1876 that the lot on West Courtland Street was purchased, and steps taken to build the church. The church's beautiful Victorian-Gothic architecture with 21 stained glass windows as well as the museum's two floor display of exhibits are just a few of the things that await you here in Spring Valley. Take a look inside the museum.